Generally, the months of June, July, August, and September have the most favourable weather conditions, with a nice average temperature. July is the warmest, while January is the coldest. April and August are the driest and wettest, respectively. From late June to the end of August it will be hot in the valleys and temperatures will be between 20°C and 30°C but these can drop to 10°C at night. At higher elevations the temperature will become cooler and this can be exacerbated by cool winds. Occasional cold fronts will bring cold, wet weather: you can expect significant temperature drops and difficult conditions in the mountains. It is not uncommon to have snow at the highest passes on the Tour du Mont Blanc during a cold front even in August. Come prepared for all weathers! Technically, you could complete the Tour du Mont Blanc from late September until late October. The weather is normally stable – often with persistent high pressure conditions maintaining cool days and cold nights with clear skies. However, many hotels tend to shut around 20 September and so make it difficult to hike the regular TMB. Winter is brutal in the Alps and storms can rage for days, bringing high winds and lots of snow. Obviously, this is great for ski resorts, but the Tour du Mont Blanc stretches across many wild and remote areas. Deep snow, avalanche risk and unclear routes make it a hazardous undertaking. If the weather is fine and stable, you may be able to head out on skis or snow shoes, but with good winter mountain knowledge. It would be essential to hire a Mountain Guide in the winter. In Spring, the days are longer and warmer and the snow will have consolidated. 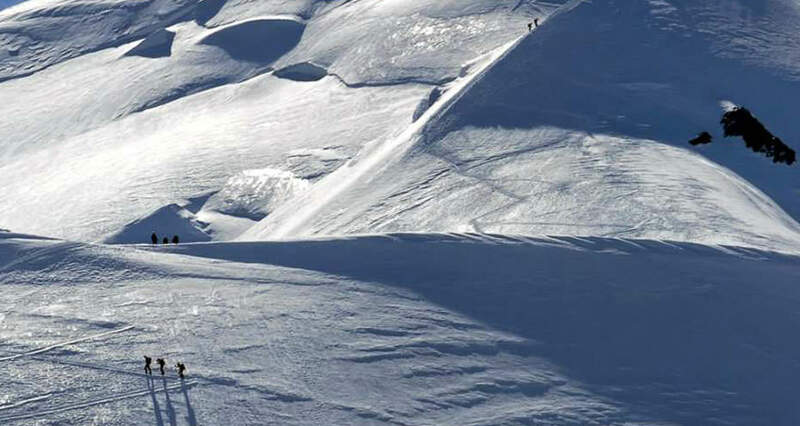 At this point skiing the Tour du Mont Blanc is possible, but you need to be conscious of slab avalanche, rock fall and the need to do quite a bit of distance in one day: some hotels will remain shut in the remoter areas and so you ski two days in one. The section from Courmayeur to Les Chapieux to Les Contamines is the most difficult. If you need any help or advice get in touch with us.